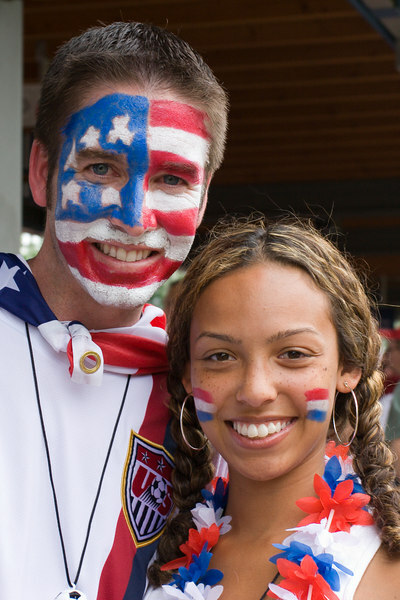 USA fans at Nürnberg station. USA (or is that "U.A. of S.?) 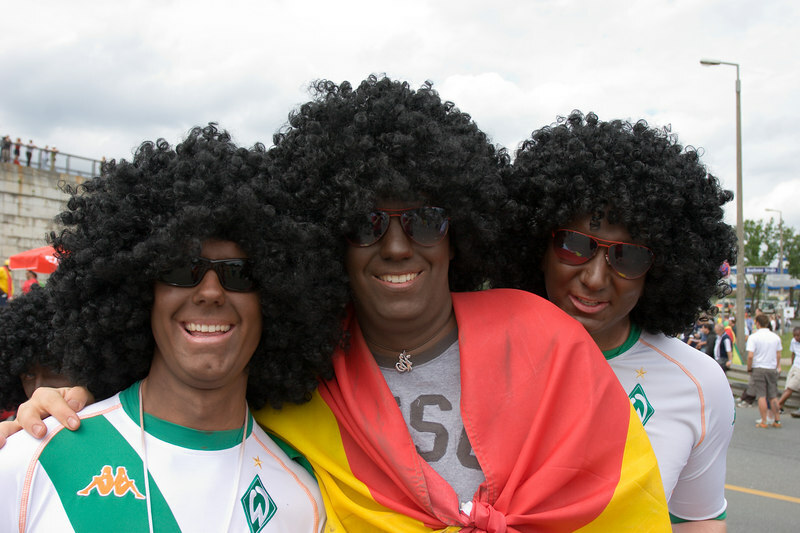 and Ghana fans arrive at the stadium station in Nürnberg. Ghana fans(?) 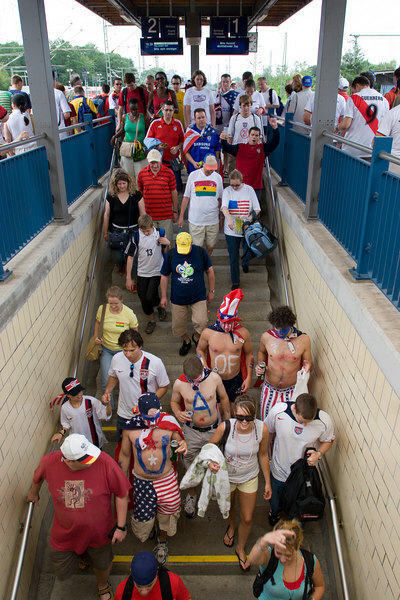 at Nürnberg stadium before the match with the USA. 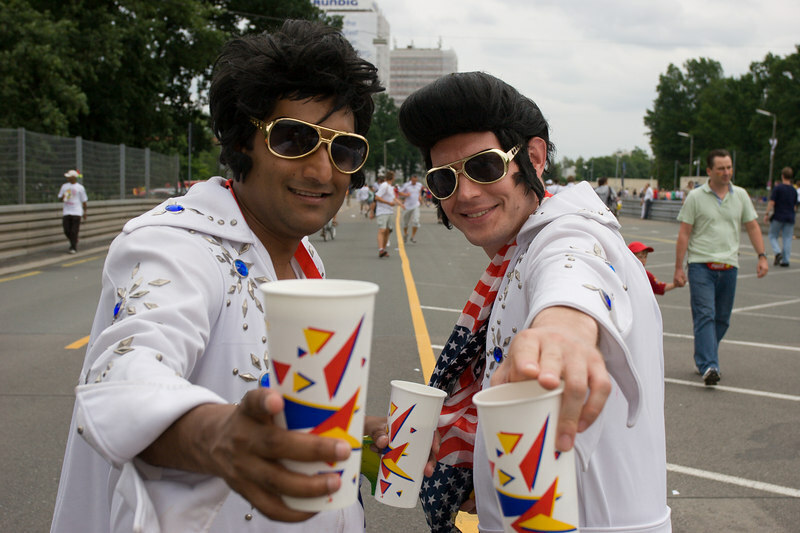 USA fans at Nürnberg stadium before the Gahan game - these two were told to turn their "Team America" shirts inside-out before they would be allowed into the stadium. 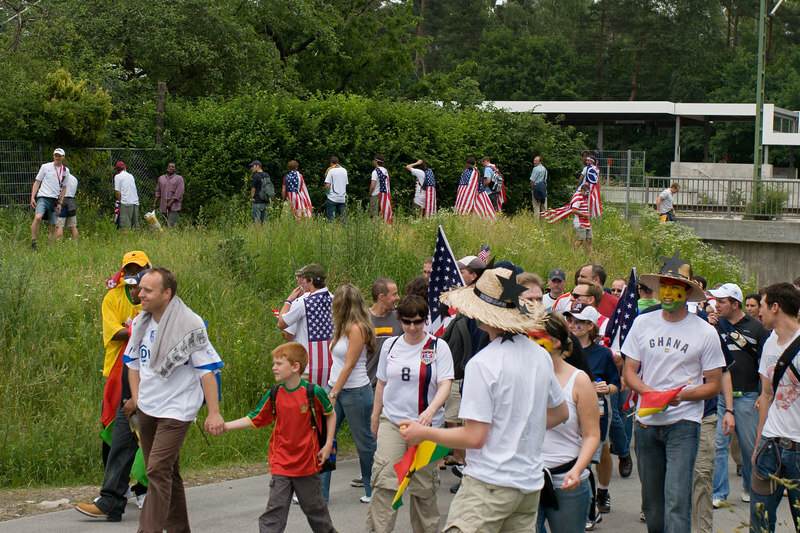 Before the Ghana game in Nürnberg, USA fans honour the stars and stripes by turning a hedge next to the stadium tram station into an impromptu toilet. 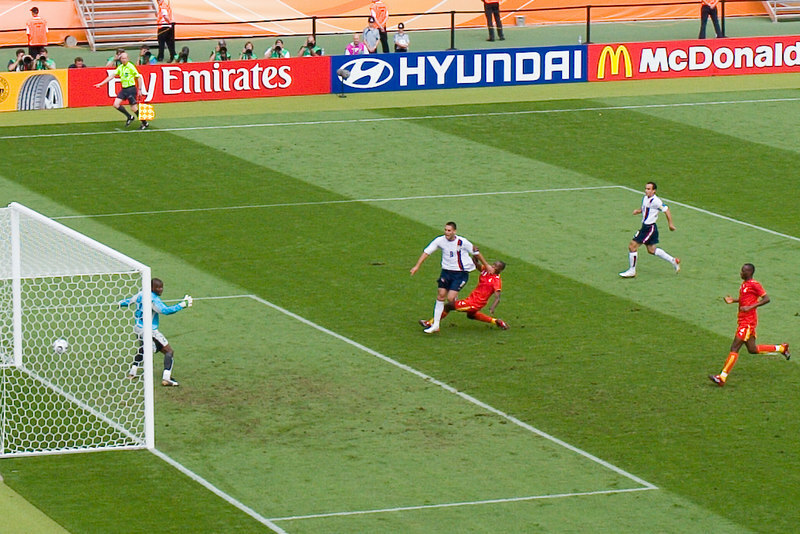 Clint Dempsey brings the USA level against Ghana in Nürnberg. 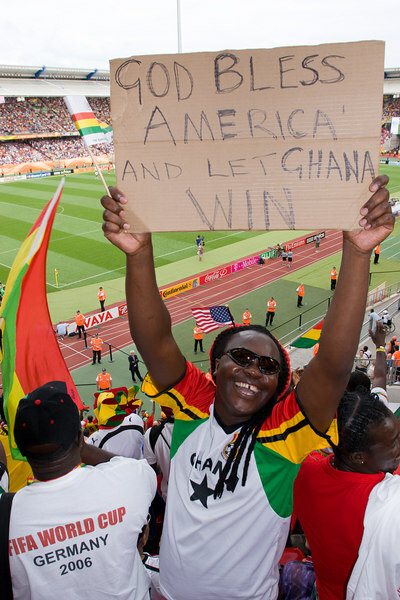 "God bless America and let Ghana win". 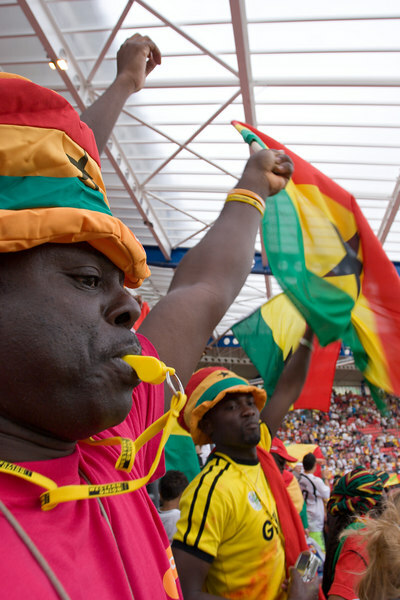 The Ghana fans were the friendliest I've ever encountered! Ghana players (some still in their red shirts, others with just white undershirts) celebrate with the fans after defeating the USA 2-1 in Nürnberg to progress to the second round in their first ever World Cup. 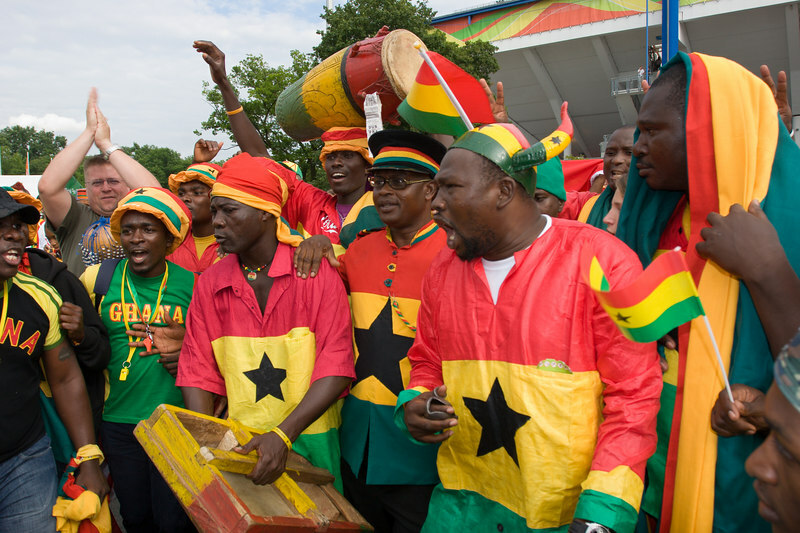 Ghana fans celebrate a famous victory over the USA. 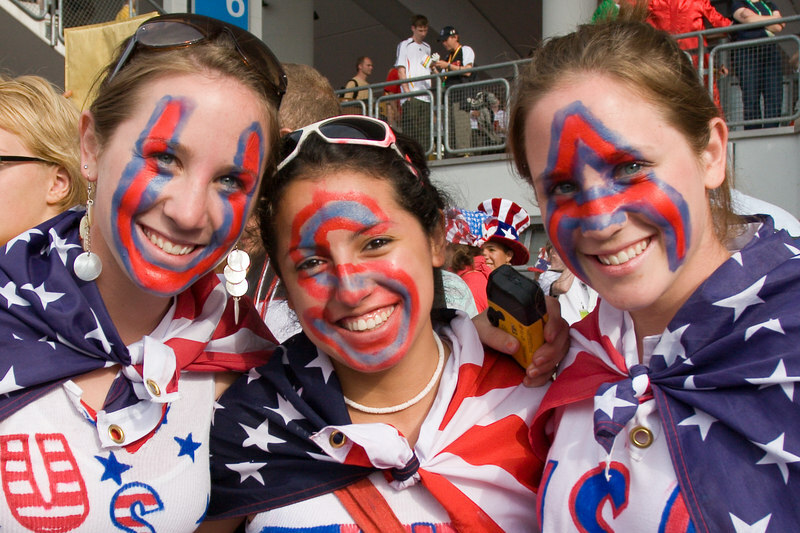 USA fans at Nürnberg stadium still smiling despite the defeat by Ghana. 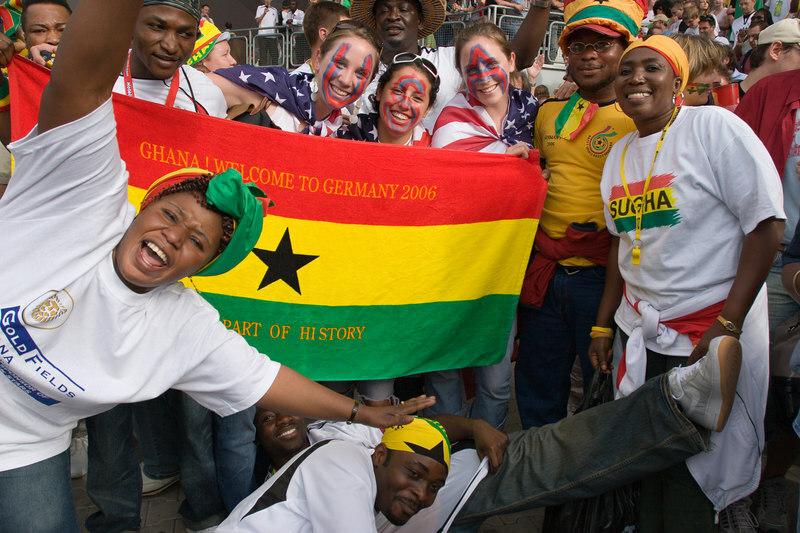 Ghana fans celebrate their victory alongside USA fans at Nürnberg stadium. 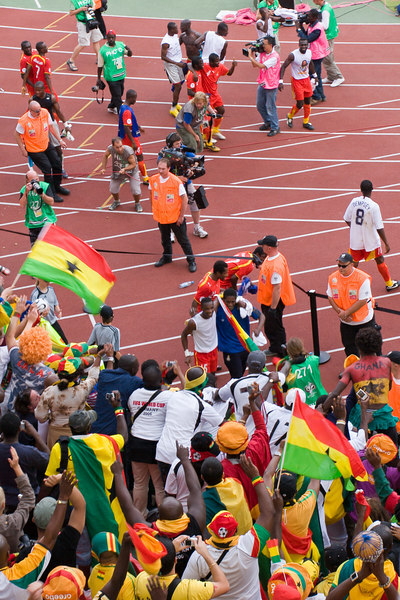 Ghana fans celebrate their victory over the USA at Nürnberg stadium. 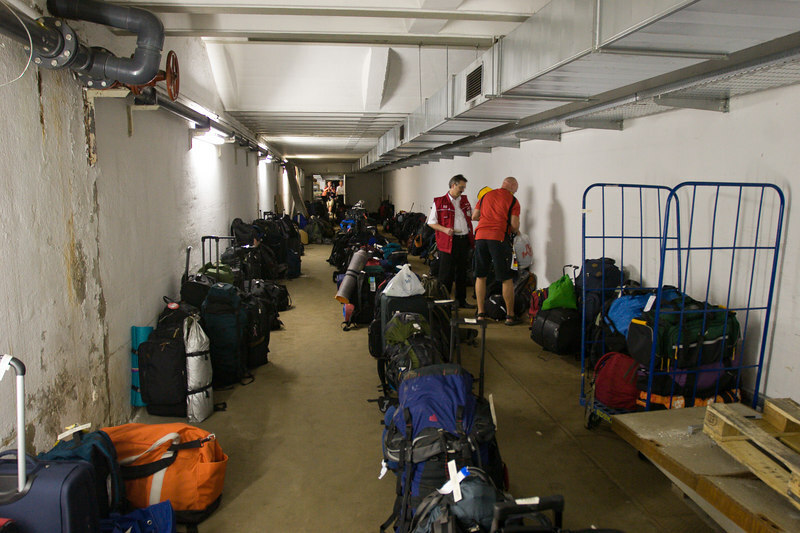 Retrieving bags in the long corridors of the makeshift luggage check at Nürnberg train station after the USA Ghana match. 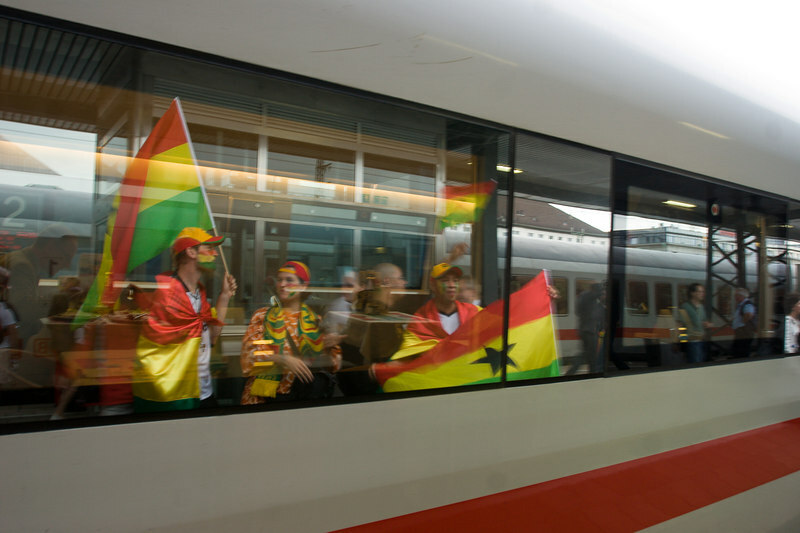 Ghana fans reflected in the windows of an ICE train at Nürnberg station after their win over the USA. 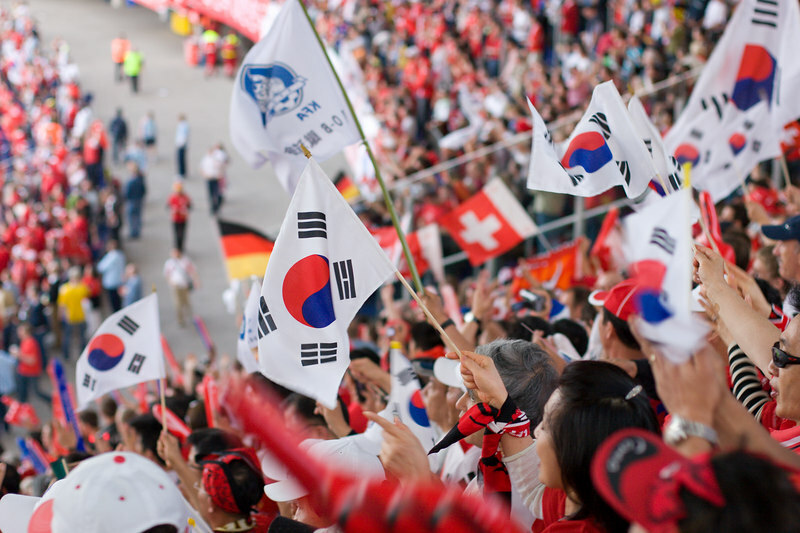 South Korea fans outside the stadium in Hannover. 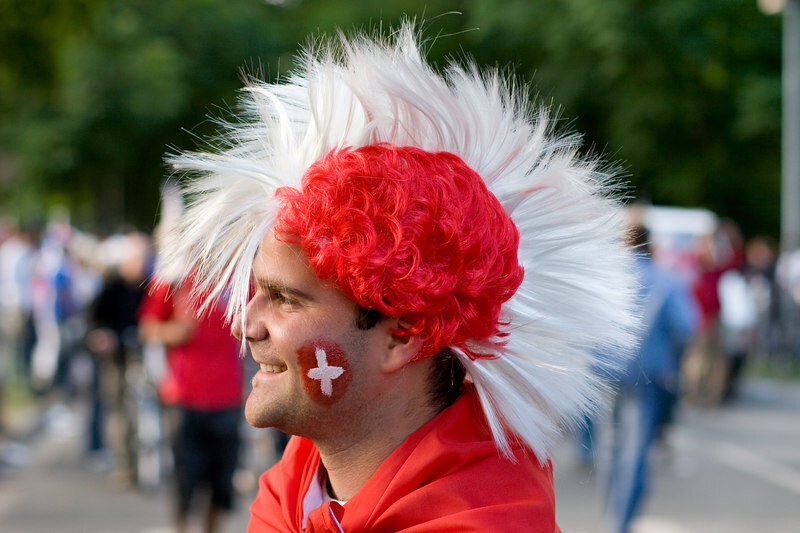 Switzerland fan with mohawk wig outside the stadium in Hannover. From a distance, it was hard to differentiate the Swiss fans from the Korean fans, since red was the color of each team's primary jersey. 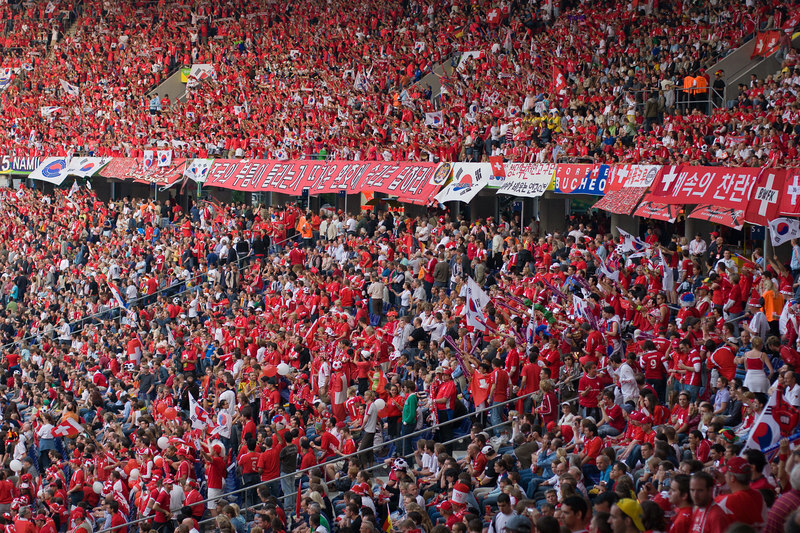 Switzerland fan at the game against South Korea at Hannover stadium. 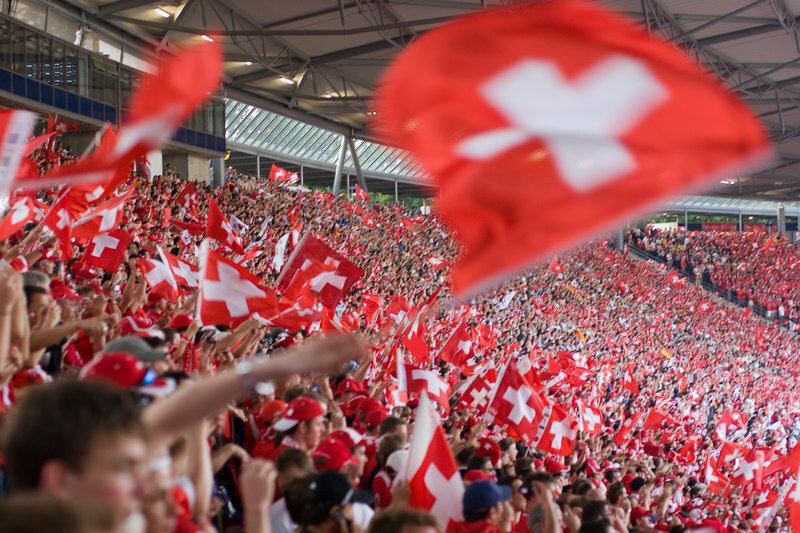 The Swiss fans were surprisingly vociferous and nationalistic (considering their neutral reputation). The South Korea fans were, as expected, well organised and passionate. 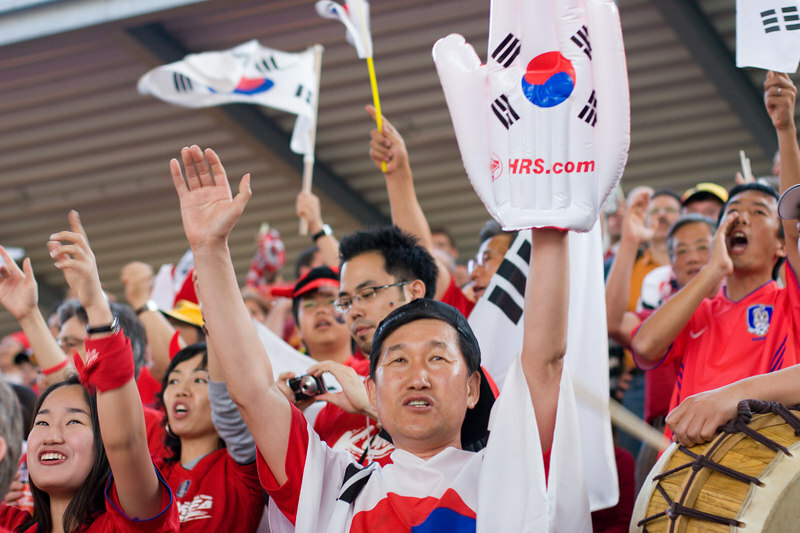 South Korea fans chanted in unison around Hannover stadium. This little South Korean fan's expression didn't change throughout the entire game against Switzerland. I think he knew from the start that his team was doomed. 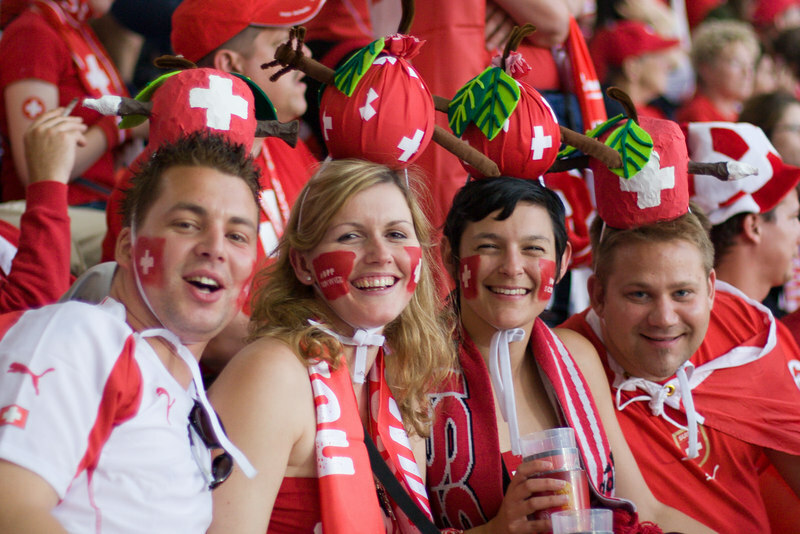 The Switzerland fans, paying tribute to one of their most famous sons, William Tell, are delighted with the 1-0 lead at half-time against South Korea. 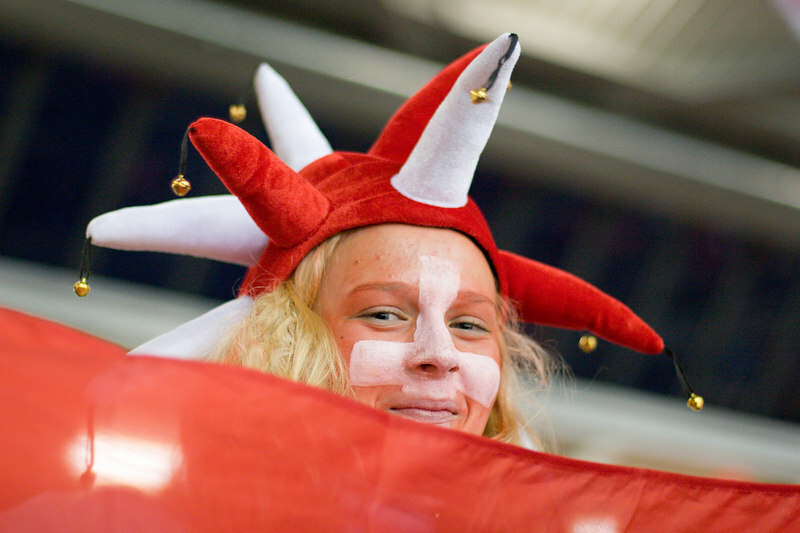 This South Korea fan puts on a happy face (and some way cute devil horns) despite her team's 1-0 deficit to Switzerland at half-time in Hannover. In case you were wondering, the team's nickname is the Red Devils. 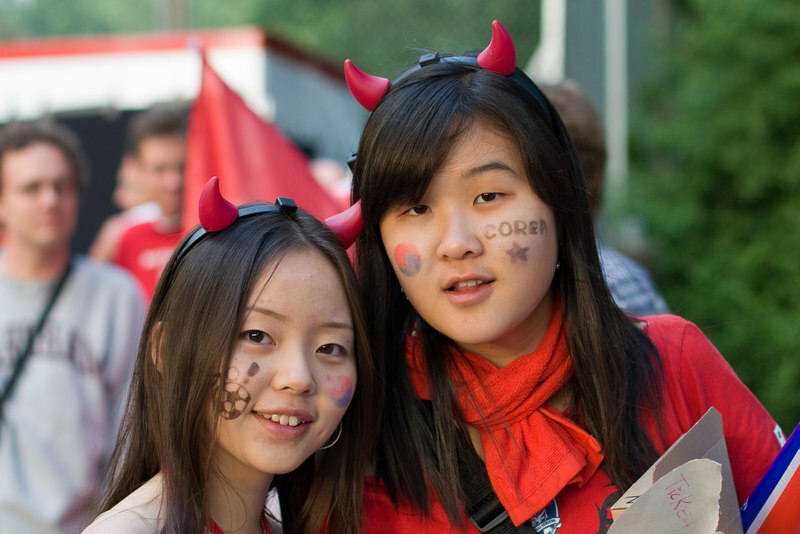 With their team losing 1-0 to Switzerland at half-time in Hannover, South Korea fans sporting illuminated Red Devil horns say a prayer. 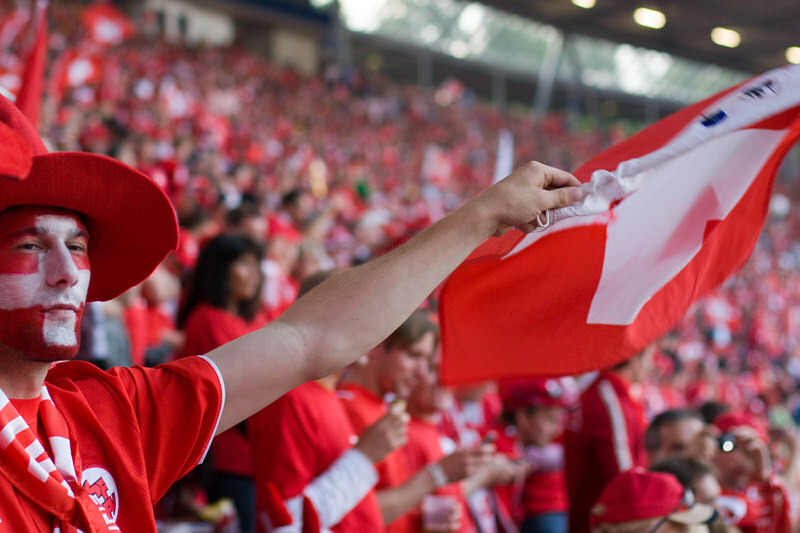 A Switerland fan can't contain her joy at victory over South Korea and the prospect of cheering her team on in the second round.